If you’ve confirmed those multi-colored, pinhead-sized beetles moving slowly and rolling over when you touch them are carpet beetles, it’s time to take action immediately. Why? Because while carpet beetles don’t carry disease, they are big eaters. They aren’t picky eaters either and they are fast breeders, so they can quickly do significant damage to any item made with natural fibers – furniture, clothing, curtains and carpets. The good news is that you can get rid of them. Here are seven tips explaining how to get rid of carpet beetles, plus additional information about how to prevent and deter future infestations. Getting rid of carpet beetles centers around cleaning. You’ll need to remove the eggs, larvae and adult beetles with intensive effort. Vacuuming. As a first step, vacuum areas where you’ve seen adults or larvae such as carpets, rugs, furniture and curtains. Steam cleaning. Your next step involves going over the same areas you vacuumed with a steam cleaner. The heat and moisture in this step removes remaining beetles and eggs. Laundering pillows and clothing. Use hot water and detergent to wash clothes, pillows, towels and linens. If you aren’t comfortable keeping infested clothing or it’s too damaged to wear, dispose of it in plastic bags and place in a sealed garbage container. Wiping or spraying surfaces with vinegar. A mixture of white or apple cider vinegar and water can be applied to shelves, drawers, hangers, window sills and cupboards to remove any dirt or food residue. Applying boric acid. Sprinkling this mild insecticide on carpets, rugs and furniture will kill any remaining beetles. Leave the boric acid dust untouched for two hours, then vacuum the residue and dispose of your vacuum bag. Using an indoor insecticide targeting carpet beetles. These sprays, available from local retailers, can be used around baseboards, under sinks, or in crevices where carpet beetles may hide. They aren’t recommended for use on carpeting, furniture or clothing. Calling a professional exterminator. Carpet beetle removal can be difficult to do on your own. They are persistent and tough household pests, and do-it-yourself treatments aren’t always effective on carpet beetle eggs. When carpet beetles have been removed from your home, steps to prevent another infestation echo the removal process. 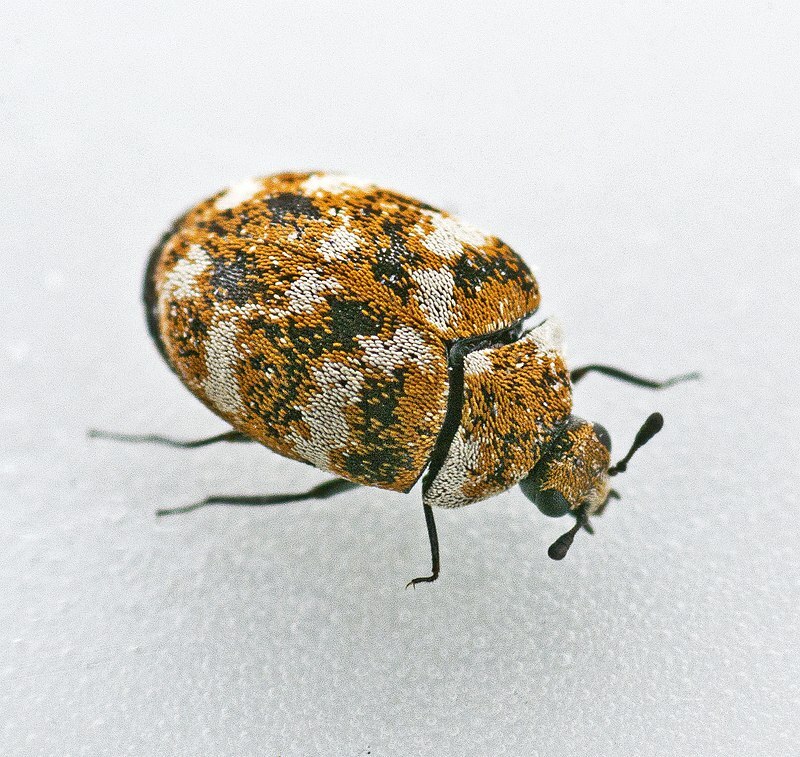 Getting rid of carpet beetle food sources, vacuuming often, and occasional use of boric acid or indoor insecticides will keep carpet beetles from returning. Since stored clothing or fabrics are targeted by carpet beetles, consider adding cedar or moth balls to your storage boxes or bags. Prevention extends to the exterior of your home. Apply an outdoor insecticide for carpet beetles around the perimeter of your house. Spray the foundation of your home and the soil two to three feet out from the house. Use the insecticide on any potential points of entry such as windows, doorways, vents, or utility pipes. Remove and destroy any bird or insect nests from around your house. Carpet beetles will lay eggs in nests and then can migrate into your home. Repair your screens, since carpet beetles small size makes any hole a potential entryway. Cleaning remains your number one deterrent to keeping carpet beetles out of your house. Trash removal, regular vacuuming, and frequent laundering of clothing, linens and pillows will make your home less inviting to these pests. Use plastic containers or bags to store linens or clothing. Carpet beetles don’t like sunlight, so opening drawers and closets to natural light will deter them. Avoid natural fibers in rugs, carpets and furniture. Carpet beetles typically don’t eat synthetics. Be aware of and remove any other type of household pests. If you’ve followed these suggestions about how to get rid of carpet beetles and still see signs of infestation, contact The Bug Man. We’ll put our environmentally responsible pest control solutions to work for you.